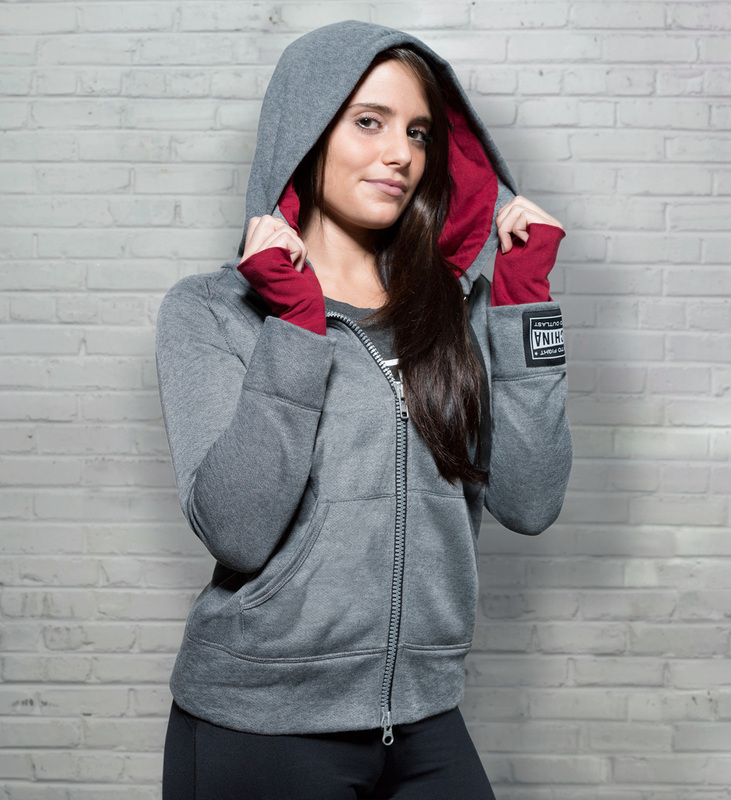 Classic in every way, yet special because the Academy Hoodie features a wide elastic waistband, wide cuffs with thumb holes, contrast-lined deep hood, large front pockets and full length double zipper. Wear it as part of your workout ensemble or just wear it out to show off a little. Read all the Academy Hoodie reviews below. 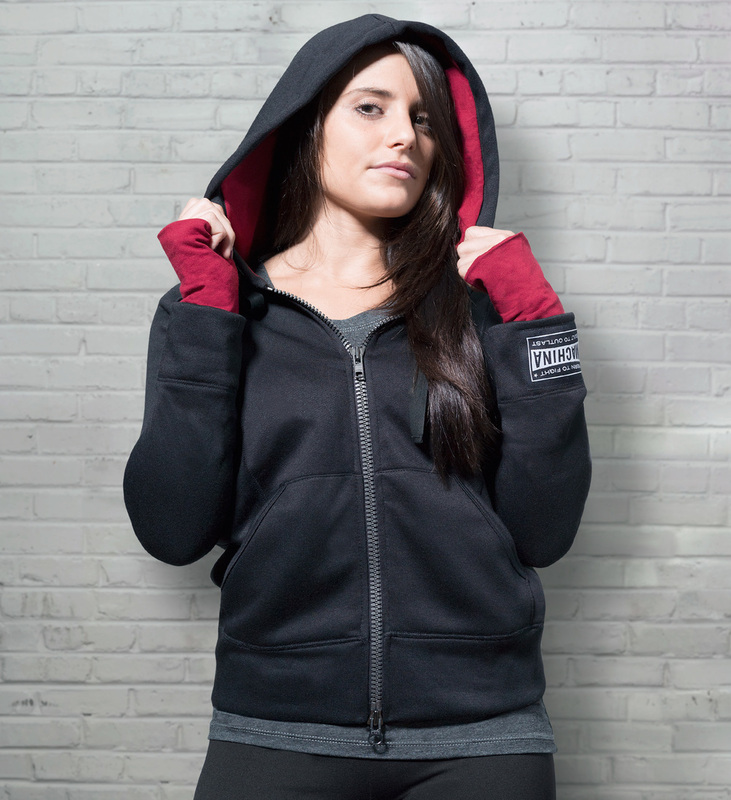 The Machina Academy Hoodie is athletically fitted with extra long sleeve cuffs featuring built in thumb holes. To determine the best fit you'll want to measure your chest size from the fullest part of your bust and around your shoulder blades. The Machina Academy Hoodie is 80% cotton and 20% polyester. To preserve fabric quality we recommend turning the garment inside-out and zipping closed for washing. It is preferable to wash cold and tumble dry on low heat or hang to dry. "A beautifully designed hoodie! Feminine and tough at the same time. I love it!" "Love the sweater! I have gray now and will be purchasing the black one too! Love the double zipper! It's my fave and I wear it a lot, which is why I have to get a second one!" "I usually wear Small, but decided to order Medium. And I was right. It's roomy, but a bit short for me (I just love long hoodies). Very soft fleece inside. I look badass! Sun, please go away, I need to rock my new hoodie:)"
"I now officially own every Machina apparel item! Every item is fantastic and the hoodie is no exception. It is a nice alternative to the thick manly hoodies out there and the grey color is a nice medium grey - not too light, not too dark. My club tees and tanks are a SMALL, but I went up a size in the hoodie to a MED and I'm glad I did. It's just roomy enough, but still fitted if that makes any sense. (For reference I am a 36C/130 lbs/5'6".) I love the chunky zipper and the lined hood! Finally a "stylish" hoodie!" "I was afraid this sweatshirt might be too short in the torso for me when I first tried it on, but I've been wearing it for weeks and haven't been bothered. It's extremely warm while being lightweight, and I couldn't possibly love the wrist-warmer sleeves any more than I already do. The extra-roomy hood has been wonderful this rainy winter. Not ideal when worn over other long-sleeved shirts (too snug), but makes a great layer under coats and windbreakers."